Magmatic eruption accompanied by bursts of dust soaring from the crater or the peak of Mount Agung until Monday (27/11/2017) morning. Including volcanic ash rain occurred in some areas, even now up to Airport I Gusti Ngurah Rai. For the sake of security and flight safety, AP I Gusti Ngurah Rai closed the airport operation this morning. “The airport will close at 07.15 WITA until 24 hours later or until 07.00 WITA tomorrow morning according to Notary from AirNav who came out,” said Communication & Legal Section Head of I Gusti Ngurah Rai International Airport, Arie Ahsanurrohim. Arie added, volcanic ash has closed air space at the airport up to 2 levels. Visual is very thin volcanic dust particles at the airport until at 5.30 WITA earlier. “But the air space is covered with volcanic ash,” he said. I Gusti Ngurah Rai International Airport Managers, Bali, temporarily shut down flight operations for 24 hours due to the impact of the spread of volcanic ash in the local airport airspace. 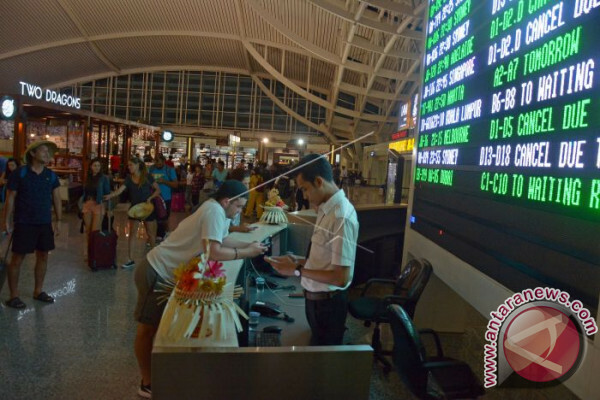 “The airport is closed from 07.00 WITA,” said Head of Public Relations of PT Angkasa Pura I I Gusti Ngurah Rai Arie Ahsanurrohim International Airport in Denpasar on Monday. According to Arie, volcanic ash has closed the airspace at the airport to touch level two. He explains visually the volcanic ash of thin particles at the airport until 05.30 WITA. “But the air space is covered with volcanic ash,” he said. Temporary airport closure is valid from 07.15 WITA to 07.00 WITA on Tuesday (28/11). The Ministry of Transportation, he said, has issued a “notice to airman” (note) or warning to the airlines in the world related to the closure of the airport with number A-4242/17. The data of Angkasa Pura I Ngurah Rai Airport mentioned up to 23:59 WITA on Sunday (26/11) the total schedule of domestic flight that was canceled and departed reached 39 and for the international schedule reached 57 good schedule that arrived and departed.